Seven of Wands says face up to this situation – assert your point of view, stand by what you value and never compromise or settle for less. Rest now – you are under pressure in this situation. You will see things more clearly in time for you are blessed with inner strength and can hold on in any adversity. Prepare to defend the very basics in your life – it will require courage and responsibility. Stand by what you value and things will unfold, regenerate and renew themselves – allowing you to move in directions that you value. You will require the assistance of others now, strength and energy will be needed, for you will be required to test your mettle to prove yourself against the competition – only then will you know whether you have mastered your lessons. Trust in your intuition and past experiences – have the nerve, sense of purpose and determination to meet the challenges that will be presented now. Stand up to opposition without backing down. When you are fired up about something, you speak your ideas and stand up for your values, you have the courage to face the odds and overcome the obstacles. Your leadership abilities will surface as your opponents test your limitations – continue to build your mastery. You have begun to include others as an extension of the self. Distinction between self will and the will of God diminishes, then disappears. The higher physical aspect of the Spiritual Plane. The foundation is laid for the integration of the body, the heart and the mind with the spiritual. They must perfect the art of remaining separate while becoming one. You are enlightened enough to function as one with the environment and everything else as duality merges into the One. The paradox is that this state of enlightenment sets you apart from others not yet at that stage. The test is to not let enlightenment separate you from those less enlightened – it should make you less separate. Here faith has crystallized into its mature form for this incarnation – but its defenses against other forms is still necessary – for it is mature but not complete. Your belief system is put to the test by physical realities. Taking a stand. Strong character and integrity. There is major new input on the spiritual level. Unsolicited advice may appear. There are physical things which must be considered in order to advance further. The lessons are to correct any flaws in your belief systems which could prevent proper development and advancement. Resolve. Conviction. Here is a warrior, certainly spiritual, but otherwise as well – the defender. You cannot fight for one minute unless you are fighting for something you believe in. What beliefs or opinions are you holding onto despite criticism and social pressure? What result would you ideally like if it could be anything you wanted? 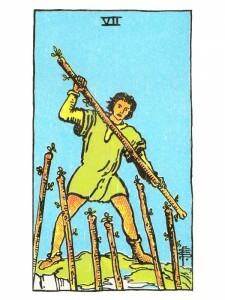 Next to Hanged Man: Give in – being stubborn will not solve anything and it can damage your character. Next to Death: Slow down – it isn’t worth it. You are going about things the wrong way. Next to Temperance: Re-evaluate your situation – you need more time to reach your goal. In the first position: The initiate has reached and will enter the gate to the inner courtyard leading to the garden of Eden. The feeling bears some resemblance to reaching puberty; an innocence is lost but more is gained. In the second position: Your clarity of purpose and resolve can always be relied upon. With your eye clearly on your goals, you simply will not give up. And while you know your position at all times, likewise you know the positions of your adversaries. In the third position: You are being filled with a sense of purpose, as you identify more and more clearly the meaning of spirituality in your life, in the daily function of your Mental, Emotional and Physical Planes. In the fourth position: There is some of Joan of Arc here, in the passion for the battle itself. Where would faith be without its defenders, its Knights Templar, its holy warriors. The act of defense frames the boundaries of the faith. In the fifth position: The clearer your mind becomes, the more defined your position. You are aware that you have drawn your spiritual line in the sand. In the sixth position: As you discover what is truly important to you and begin to move and act with conviction, you will be rocking the boat of your present establishment of relationships and the conduct of your creative affairs. Oddly enough, your expansion of appreciation in the Mental and Physical Planes may prove bothersome to many, threatening to others. In the seventh position: There are many versions of Satan’s fall from grace as the result of his refusal to bow down before God’s new creation, man. So too are we tempted not to bow before our fellow man. The lesson here is that we must bow down before one another as recognition of the divinity that resides within everything. In the eighth position: Here is the proof that spiritality is a contact sport. You are up to your neck in witnessing, in physically implementing your beliefs. Integration of spirituality into the physical daily regimen is taking place. This is the early appearance of Zen, wherein everything done is infused with an awareness of its importance in the overall scheme of things, nothing is unimportant and so is done with care. Also, the early appearance of Hatha Yoga and other body work/body movement systems which reflect this same depth of awareness of God in the body and nature. In the ninth position: You are empowered by your excitement at having discovered your center, your way of linking the past with the future, your place in the present. In the tenth position: Your next lesson requires you to integrate your lofty ideals in a very pragmatic ways. Your spirituality must be worn on your sleeve – not in loud, garish colors – but in sensitive and sensible observation in daily habits. This appears to be a very strong card to draw, especially for a single card draw. What position would that equate to? Wow, dont know what to say but there has b some purpose in my life and I have gone through so much inmy life that i just love it when i am underestimated! And I’m usually over looked and tho i am left out and passed up knowing that i could handle any situation. And i see all the hate around me. I know that I’ll b fine it’s just I’m so curious and anxious to get the answers and find out when all this is gonna pay off! Thanx for the heads up!